Seeking a larger share of global composites market. Russia aims to regain its leadership in the carbon fiber sector and the production of strong, lightweight composite materials used in construction and industry. In the 20th century, Russia was a world leader in the development and use of carbon-fiber technologies, which are the foundation of composite materials. Materials based on carbon fibers possess unique properties. They are 10 times as strong and four times as light as metal. This has lead to a burgeoning demand for composites in the automotive, shipbuilding and aircraft-manufacturing sectors, with the global market growing up to 15 percent annually. Overall, the global composites market amounts to 12 million tons a year and is estimated to be worth some $483.5 billion, however Russia produces just tens of thousands of tons a year and accounts for just 0.3-0.5 percent of the world market. Sergei Vetokhin, executive director of the Union of Composites Manufacturers, says Russia has some unique products in this field, such as mobile pavements that make it possible to transport heavy machinery to remote and hard-to-reach terrain, including swamps. To regain a large share of the global composites market, in 2013 the Russian government adopted a roadmap for developing the sector. The plan calls for Russia to produce composite materials worth $1.9 billion by 2020, with 10 percent of the materials being exported. Historically, the production of composite materials in Russia has been closely linked to the nuclear sector. The homegrown technology for producing carbon fibers was developed in the 1980s at nuclear-sector enterprises. The state nuclear corporation Rosatom, which is involved in developing a fully fledged carbon-fiber market in Russia, is establishing exports to other countries. In the spring of 2015, Russia launched the Alabuga-Volokno fiber plant, which the Kompozit holding company built for Rosatom. The first stage of the plant cost 3.3 billion rubles ($53.2 million). “The new plant will enable the quadrupling of the production of composite materials,” says Alexander Lokshin, first deputy head of Rosatom. This will result in lower material costs and wider applications, he says. “That is why we believe that Agabuga-Volokno will be instrumental in reducing Russia’s dependence on imports,” adds Lokshin. For the time being, the plan is to produce two types of carbon fiber: Umatex UMT42–12К — which is used in manufacturing cars, ships and aircraft as well as in the wind-power industry — and Umatex UMT42–24К, which is used for other industrial needs. A feasibility study that Rosatom commissioned for using composite materials at nuclear power plants has already been prepared. The study looks at using composite fittings in the production and assembly of concrete constructions and using composite pipes in cooling towers. Experts believe that the use of composite materials will make it possible to improve the quality of nuclear power plants being built. Composite materials are superior to metal since they are not subjected to corrosion, whereas metal pipes in cooling towers rust and require constant maintenance. By contrast, composite fittings are immune to corrosion and are superior to metal fittings in several other key aspects. In the near future, nuclear power plants will be built at least partially out of composite materials. In the meantime, the plant in Alabuga is operating in a test mode. It manufactures pilot batches of products and distributes them among potential customers. Dozens of contracts with buyers in many countries are expected to be signed by the end of 2015. Rosatom is also planning to build the second stage of the plant with four production lines. 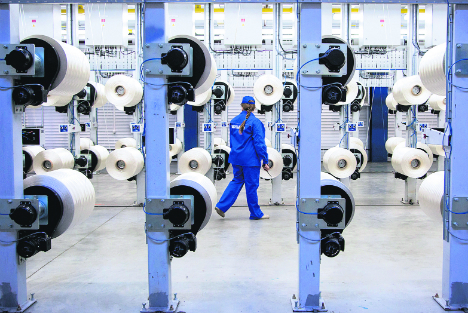 The company hopes that by 2020 it will be able to increase annual production to 10,000 tons and account for 7 percent of the global carbon fibers market.